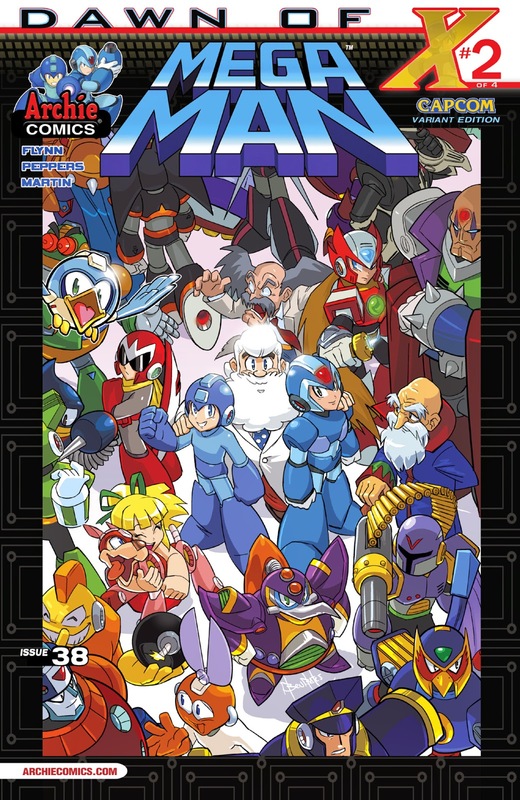 "THE EPIC MEGA MAN/MEGA MAN X CROSSOVER EVENT CONTINUES in DAWN OF X pt2! We travel one hundred years into Mega Man’s future, where an ancient Wily weapon threatens all defenseless humans! It’s up to X and Zero to combat the lumbering metal monstrosity! Meanwhile, Emerald Spears terrorist-on-the-run Xander Payne tumbles through time—and sees something that will change him forever! Don't miss the event that everyone will be talking about, featuring brand new cover art from PATRICK "SPAZ" SPAZIANTE and an extra special character-packed variant cover from BEN BATES! An ancient Wily weapon, huh? Metal monstrosity? I don't remember the Yellow Devil being made out of solid metal, but who's to say that is the Yellow Devil. That aside, I have serious questions about that thing surviving for a hundred years. And furthermore, I'm going to be disappointed if it "triggers" something within Zero, since Zero is apparently going to be fighting it as well. Also "love" how Axl is half-covered up in the alternate cover. Who knows? It could be the Shadow Devil from X5, the "Steel Devil" from Dreamwave Comics, or even an original creation. And that variant cover is really good! The variant cover has quite a few interesting additions to the cover, though I'll admit I'm a bit curious how a certain "card-shark" ended up there as well. Ian has mentioned that he enjoyed Command Mission, so maybe we'll be getting some early cameos or shout-outs from future games? Also, it seems the newest issue has been out for a few days on Archie's app and Comicology for those who like their issues digital. 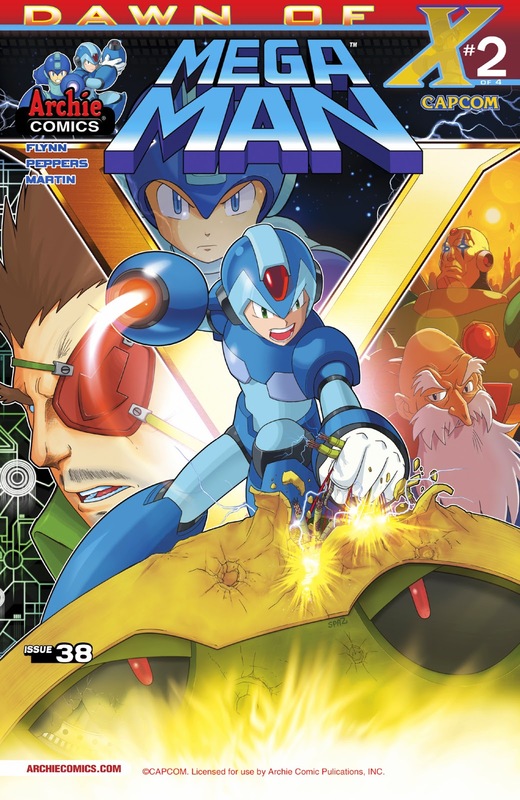 I really love the variant cover that is done by Ben Bates, though I am curious about this new "ancient Wily weapon" that X will be combating against in this issue. Perhaps they're fighting against the Shadow Devil from Mega Man X5? Is it summer yet?? Want! NEED! Especially that variant! As much as I hate spoilers, I will always end up clicking on the covers and staring at them forever, and then wish I had no idea what's coming. If they get Ben Bates doing more interior art for the X stories I'll probably die of joy. Ben Bates is pretty awesome. I love his work on Archie's Mega Man, as well as IDW's TMNT. I don't think he's used often enough, though.